QuickStart 2000 Electronic Ignitions - Brings your antique Harley back to life, works on six & twelve volt systems, works with most stock coils, easy two wire hook up and fits your original stock distributor. • See what all the hype is about and order yours today! Welcome to EBeyond2000.net, home of the QuickStart 2000 Electronic Ignition for antique Harley Davidson motorcycles! Do you have an antique Harley Davidson motorcycle that is difficult to start, even more so when it is warmed up? I have the product for you and your bike - and once you purchase it, you'll wish you had tried it sooner! Some customers have had their units in their bikes for over 20 years with great success and are STILL WORKING! My name is Ed Fralick and I would like to welcome you to EBeyond 2000, my hi-tech company. I design, create, promote and sell items that are not currently on the market. The items I develop are useful to everyday people. I offer you the best place on the internet to find high quality, unique, hi-tech products for your motorcycle, home and shop. My exciting invention, the QuickStart 2000 will bring your antique Harley back to life and make it run like it never has before. See the invention that has everyone talking! As President of EBeyond 2000, I stand behind all of my products. Everything shown on this site has been designed, created and tested by me. If you have any questions about any of my inventions or products, please feel free to contact me. Ed Fralick is a creative and innovative business man, whose honesty and integrity is well known in the Charlevoix, Michigan area. A welder by trade, Ed has actively pursued sculpting as another way to express himself. 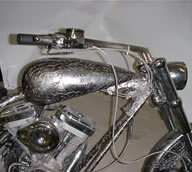 Ed hand builds everything from race cars and antique motorcycles to steel furniture and stained glass pieces. Ed spends his time creating with anything he can get his hands on, and is a visionary to say the least. Making his own tools and machines is a gift from his dad. 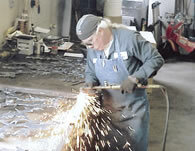 Ed's shop has plasma cutters, a forge, a foundry and much more dating from 1920 to the present. He enjoys spending quality time with his grandchildren as well as teaching them how to create in his shop.